Most of you hopefully know me from the other forums, but it is me... James 'S'panky. Brief history, I joined the R2Builders group in 1999 just after seeing the Jongsma brothers home made R2 at Celebration 1 in Denver, CO. I joined when there was only 30 members at the time. I have built two R2's with the first being wood, styrene, resin, home made bicycle chain geared head rotation system and of course the original D&D spun domes. I decided to scrap and sell off all of R2 one when our club grew in 2002. We started developing our own CAD files for parts and started making the first Aluminum parts (now known as the Legacy parts). I built most of my second from legacy parts and even designed some of my own to complete my build. 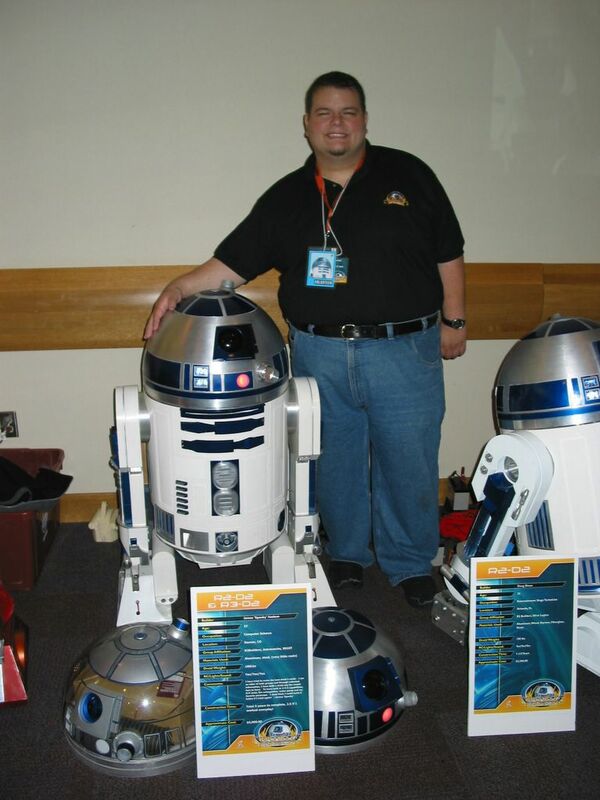 I attended Star Wars Celebration 3 and brought my R2 (with my original R2 head and my R3 head). Pretty much after C3 I shut down and R2 was a nice corner conversation piece. I have always lurked in the shadows over at Astromech.net but haven't done much. This last March/April I attended Wonder-Con in Anaheim, CA and ran into OLD friends from C3 and met new ones. And I worked the table as I once did years ago at C2 & C3, but as I hung out with long lost friends and seen the public... I realized I wanted to get back into R2. Well I ended up starting what was supposed to be an upgrade build to my existing R2, and now I am 9/10 of parts collected for R2-D2v3. So yes!!! Now on to why I joined this group. I have been a Patron of Michael Baddeley, and now I have seen the awesome files that Martin has been doing for 2-3-2 and battery boxes. I also would like to build a chopper and my very next build (as I already bought the frame and some of the Cary V1 drive system). Feel free to contact me, I love to talk apparently. Wow, that is an impressive history of R2 building. Do any of the droids from the earliest days of the group still exist? Seems sad if they are all gone or upgraded beyond recognition. Welcome to the group. Any contributions / suggestions from long time club members are always welcome here. My R2 made his debut at Dover Comicon this year. After that, I spent four days in Altlanta entertaining many of the 80,000 guests at Dragon*Con. In December, he is going to the Ocean City Comicon. Since it was so fun to work the crowds, my wife wants her own droid for next year’s Dragon*Con. So, I think my second droid will be a chopper. Mostly because I don’t think I can fit to R-series droids in my X-3. (11-29-2018, 09:22 PM)Martyman Wrote: Wow, that is an impressive history of R2 building. Do any of the droids from the earliest days of the group still exist? Seems sad if they are all gone or upgraded beyond recognition. Like I said it was partially you who got me to come over to this site (I am talking to you over on the Astromech site about the batteries for aluminum battery boxes). Yes actually, my second R2 is all in one piece (the one shown above, that is all I ever got with him). I was building him for 2-3-2, but I couldn't get the center leg "tracked" perfectly so it gets off the rails and I have issues. And I never finishded his drive system... He is however fully RC from the waist up! And there are scooter motors (with a controller in the body for hookup), I just never completed him.